In optical fibre telecommunication systems, the chromatic dispersion effects must be corrected for data rates of 10Gb/s or more. O/E Land has applied its expertise in fibre Bragg gratings to offer the dispersion compensation grating filtres, with model number OEDCG-100, to correct for chromatic dispersion. The dispersion compensation grating filtre features a compact size, small insertion loss and customized dispersion slope. Our unique fiber grating apodization technology enables us to fabricate dispersion compensation grating filters with high isolation, low side lobes and low ripples. 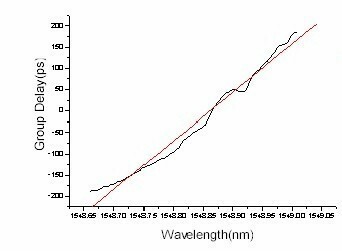 The figure below is the reflection spectrum of our dispersion compensation grating filtre. All fiber gratings are tested to assure they conform to the highest quality standards. Technical support is available to meet every customer specific applications: from prototype development to full product manufacturing.